A rabies vaccine reaction can cause serious problems, but any vaccine has the potential to cause a reaction. It happens when some dogs' immune systems are overloaded and unable to deal with the vaccine(s) appropriately. The vaccine reaction can come from the disease itself—in other words, the amount of virus or bacteria in the inoculation causes disease rather than preventing it. Vaccine failure, on the other hand, refers to the vaccination being unable to protect against challenge—the exposure to the agent it should protect against. Other times reaction could arise from the adjuvants in the vaccine designed to stimulate the immune system's response. Immediate reactions are things that you can see either immediately or within a day of receiving the vaccine. There is no first aid for vaccination reaction. Consider this an emergency and take your dog to the vet immediately, even if it is a mild reaction. That way your vet can both record it on his notes to be aware of in future vaccinations and also report it to vaccine manufacturer and federal overseeing body. Remind your vet in the future of his reaction, and especially let any veterinarian who is not your regular vet know about the reaction. He will have the same reaction. He could have a worse reaction such as life-threatening anaphylaxis. Rabies is the only vaccine that is legally required, and it must be given by a veterinarian. 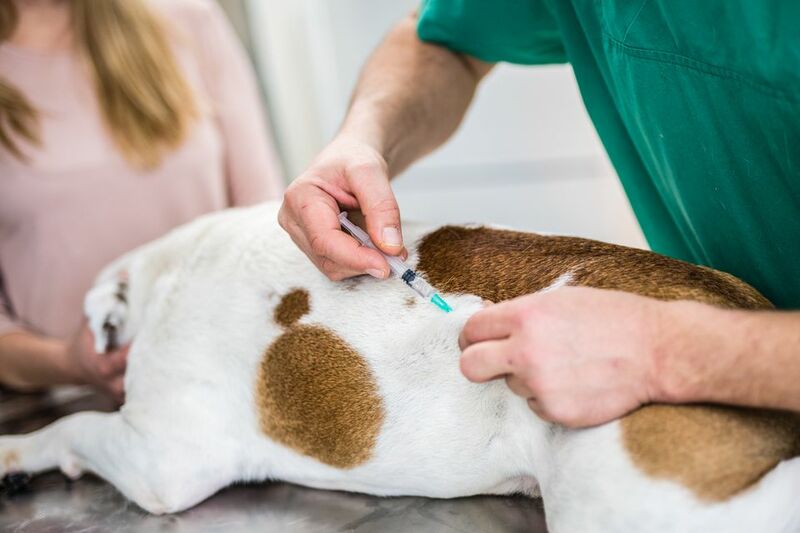 If your dog has had a bad reaction to a rabies vaccine, you can ask your vet to write a letter stating that your dog has the potential for a life-threatening reaction to another dose of vaccine. It’s up to the governing bodies in your area whether they will exempt your dog or not. Each vaccination may have specific signs of reactions. There are severe reactions (Type I) that typically occur within hours to days after vaccination, and also delayed reactions, both medical and behavioral. The delayed reactions are not so clear. That’s because they may start within a week but can last much longer. Other times they only show up weeks later. These delayed reactions remain controversial as to whether there is a direct link to the rabies vaccine. Conventional mainstream veterinarians including Dr. Linda Breitman would like a more direct cause-and-effect scientifically established. Holistic veterinarians such as Dr. Jean Dodds believe there is a direct vaccination link to a wide variety of medical and behavioral concerns, listed below. Clingy, separation anxiety, "velcro dog"